I spent this weekend with Heidi at Copper Mountain watching the US Freeskiing and snowboarding athletes compete in Olympic qualifiers. Given neither of us ski, we stayed near the base and watched the half-pipe event. Sadly, we were too cold to stay for the entire event, but we did get to see the likes of Scott Lago and Louie Vito, to name a few. The hike up the ramp to the half-pipe was hard enough, but we managed to plant ourselves near the end of the pipe on the left-hand side, while we watched countless spectators slip and fall right behind us. We were definitely in the wipeout zone and occasionally we found ourselves in the spray zone as well when athletes came to stop. Most the time we managed to get our back turned to the spray of snow before it hit us, but there was nothing we could do about the giant flakes falling from the sky into our face. The conditions were rough for the athletes, but they still pulled off all sorts of tricks and caught big air. We found our spot was perfect for smiling in the background of multiple athlete interviews, and had an appearance on television the last few days as NBC Sports replayed the event. This was all by accident as we had never attended an event like this previously, but it was fun none-the-less. When we weren’t freezing in the ten degree temperatures and heavy snow, we were scouting out the different restaurants to try at the resort. We definitely ate our way through Copper trying breakfast burritos, freshly cooked mini donuts, bacon cheeseburger mac and cheese, tortilla soup, corn chowder, fantastic sushi and more! We also joined Brian, Steve, and Katie who worked for the US ski team as well as for sponsors for the event at the local watering holes. I had planned to snowshoe on Friday, but the group coming from Denver cancelled, so opted out in the snowy conditions as I wasn’t familiar with the area. 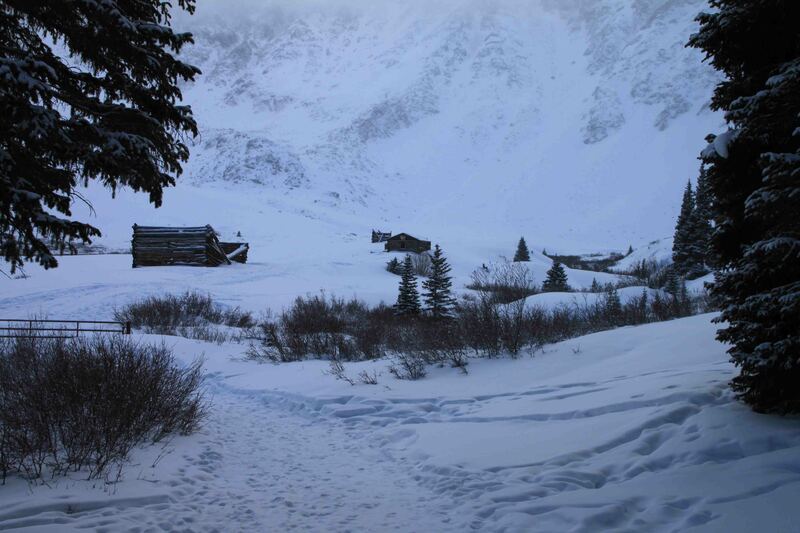 On Sunday, however, I decided to at least look for parking and trailhead of Mayflower Gulch and Boston Mine. If it looked relatively straight forward and safe, I planned to snowshoe on my own. The snowy parking lot was home to three or four cars, the trail was open and smooth, and the information board at the trailhead included a map and all the details of the trail. As such, I felt safe to go on my own…not without first notifying a friend of my whereabouts. According to the information, the trail was ranked “moderate” and the roundtrip would have been 5.6 miles had I snowshoed all the way to the Mayflower Amphitheater. Personally, I was more interested in the mining ruins and the Boston Mine camp that was constructed in the late 19th-century by prospectors who wished to mine a thick vein of mountain-bound gold outside Leadville. Unfortunately, the ore’s purity was poor, and the would-be gold town went bust before it boomed. I followed the hard-packed snowy trail through the snow-dusted evergreens in fifteen degree temperatures and light snow. Newly retired from soccer, I found myself winded as I noisily trounced up the slight incline that began at 10,996 feet and topped out at 12,415 feet. About a mile into trail, I finally found the first remnants of the mine as well as crossed paths with three cross country skiers finishing up their morning jaunt. On the left of the trail was a mining cabin covered in snow and on the right was a structure that seemed like it was balancing precariously on a vertical, wooden beam that had snapped in half. After stopping to admire the old structures, I continued on toward the camp which was situated in an open space by the creek. It was so cool. I inspected the old ruins, checked out the views from the structures, and once in a while sunk to my knees in snow. Most of the surrounding mountains appeared hazy beneath the falling flakes, though one mountain in the distance glimmered in the sun. It looked magical. As I returned to the car, I stopped once in a while to listen to the birds chirping in the otherwise quiet, solitude. I was definitely the noisiest thing around with my hiking poles squeaking, my ski pants swishing, and my snowshoes crunching in the snow. I began to wonder how much more weight in clothes I carry while hiking in the winter versus the summer. I’m certain I burned more calories than normal on a 3.2 mile hike! It’s a lot more work while wearing all those clothes, especially if nature calls! I also thought of those birds. If I were a bird, I would not pick to winter in the Rocky Mountains…of course, Denver is the coldest place I plan to live. Previous Post The Rockies: Dinosaur Ridge! What a cool trek! I am so looking forward to the Olympics. And you make snowshoeing sound so interesting. Thnx. Really enjoyed this one!